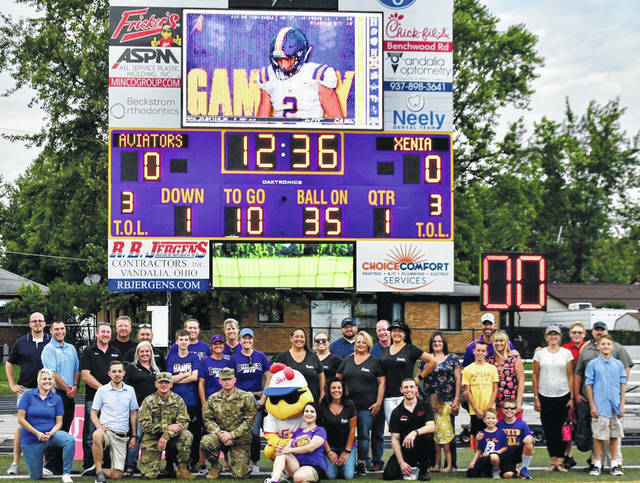 Sponsors of Butler’s new scoreboard gathered for a photo prior to the Aviators’ overtime win over Xenia at Memorial Field at Miami Valley Hospital Athletic Complex. VANDALIA — Last Friday’s football game will long be remembered for the dramatic overtime win over Xenia, but another aspect will have long-ranging benefits. Butler’s new scoreboard was formally dedicated and the sponsors who made the project possible were publicly recognized. Representatives from Abbey Credit Union, Kroger, Fricker’s, Chick-fil-A, All Service Plastic Molding (ASPM), Vandalia Optometry, Beckstrom Orthodontics, Neely Dental Team, R.B. Jergens Contractors, and Choice Comfort Services, Wright & Schulte, Ohio Army National Guard, Elite Termite and Pest Control, Plato’s Closet, and Seibert’s Curb Appeal joined with Side Effects, the company who identified sponsors, prior to the football game. Thanks to the sponsorships and a contribution from the Athletic Boosters no tax dollars were used for the scoreboard. https://www.vandaliadrummernews.com/wp-content/uploads/sites/19/2018/10/web1_Scoreboard.jpegSponsors of Butler’s new scoreboard gathered for a photo prior to the Aviators’ overtime win over Xenia at Memorial Field at Miami Valley Hospital Athletic Complex.